The Upper Room is one of two centers of energy at Carmel Temple. 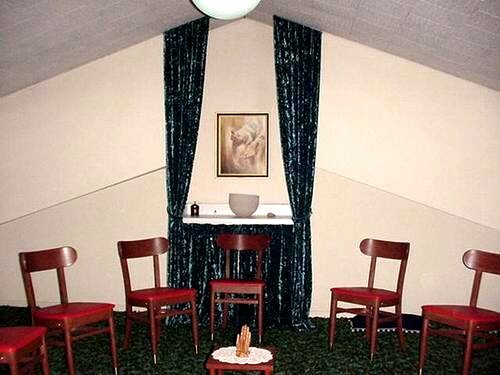 The Upper Room is located upstairs and it is a place for meditation. Anyone may enter the Upper Room whenever they wish with one requirement. They must maintain silence in support of all who go there to meditate. The Upper Room is designed and constructed using Sacred Geometry, which allows the Energy of God’s Divine Love to flow in abundance and surround all who enter. Many have sought answers, gained insight, received healing and enjoyed the energy. The second center of energy at Carmel Temple is located beneath the Blue-White Healing Light. 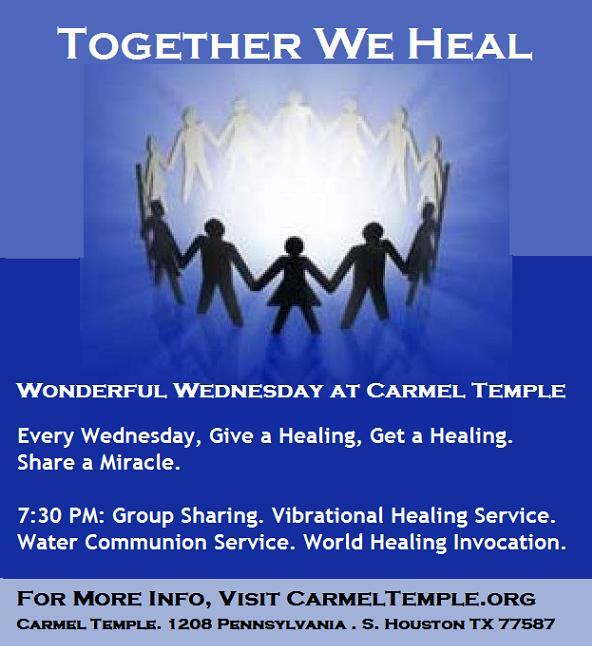 The founders of Carmel Temple, were guided to create this space so the energies of Love and Healing could flow into the Sanctuary and reach individuals in great need. Every Wednesday night, a Healing Service is held under this Healing Light. Each individual who attends the service is invited to sit in one of the chairs under the light. Everyone else present is asked to extend healing energy to the individual sitting in the chair by visualizing them in their perfection. As a part of the service, Healing Energies are also extended to the names or intentions placed in the Crystal Prayer Request Bowl. 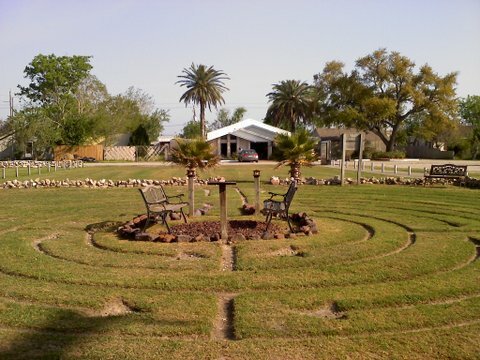 Carmel Temple has an outdoor labyrinth, located on the east side of the Annex, across the street from Carmel’s Sanctuary. It is based on the famous labyrinth at the Chartres Cathedral in France. Here is a night picture of the well-lit labyrinth, taken from the rear, looking toward the arched front entrance. The Labyrinth is open and available to walk 24/7/365 with continuous lighting for night walks. 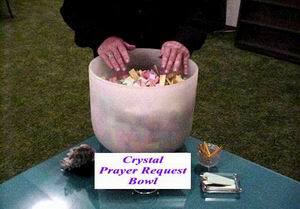 The Crystal Prayer Request Bowl is used to collect prayer requests sent to Carmel Temple. It is placed under the Blue-White Healing Light at the beginning of healing sessions in the Sanctuary. The prayer requests then receive the energy and prayers of those present. We encourage you to place into the bowl the name (even the initials will do) of the person, persons, or situations that need prayer or healing energy. This procedure has been very effective and that bowl has an excellent reputation! We encourage you to use it. When the bowl is full, those prayer requests are gathered and placed in the walls of The Upper Room, where they continue to receive the powerful energy of that special place. This loving practice has been used since Carmel’s beginning. For many years, Carmel Temple has provided a prayer request line by telephone. You may still place your prayer request by calling Carmel Temple at (713) 944-0014. Now you may also email a prayer request right here by filling out the Prayer Request below. All prayer requests will be collected from our e-mail and from our telephone system and placed in the Crystal Prayer Request Bowl at Carmel Temple. This loving practice has been used since Carmel’s beginning in 1970. Either way, your request will be placed in the bowl for you and it will be included in the healing sessions. Fill out the Prayer Request below.